Notice how there is a rectangle of empty space around the text in the image. This will automatically leave blank space around the text when the image is displayed on a web page. 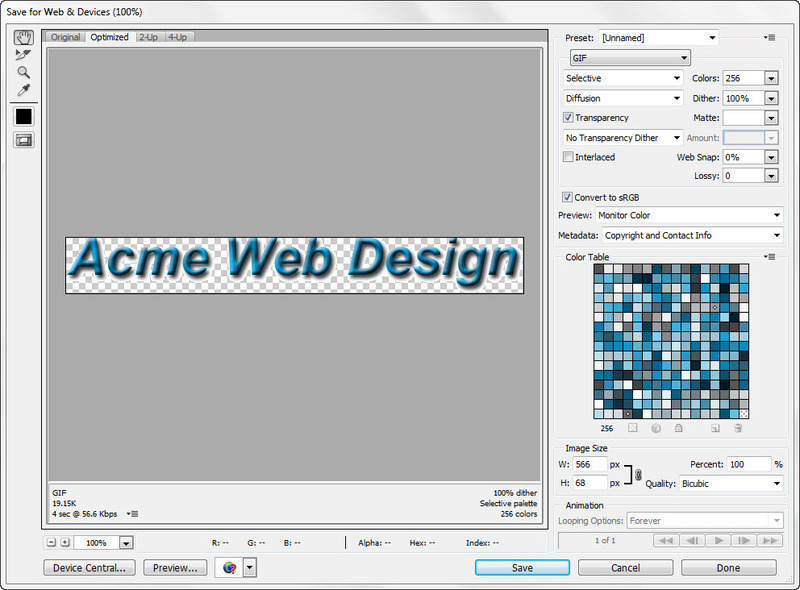 If you would like to reduce the dimensions of the image to the width and height needed to display the text (without an empty area bordering the text), you will need to to trim the image by selecting Image >Trim. 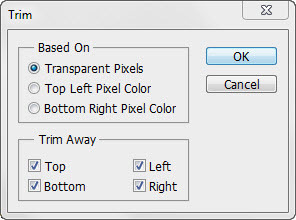 The Trim dialog box displays, as shown below. Click OK. 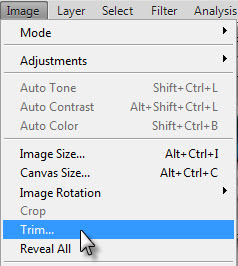 If you trimmed the canvas around the image, your Photoshop work area should now look similar to the one shown below. 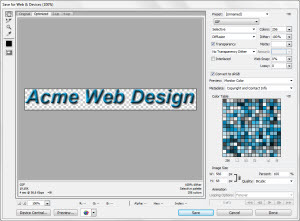 Select File > Save for Web & Devices to optimize the image for the Web. See the screen capture at the left (click on it to view a larger version). The Save for Web & Devices dialog box has four tabs: Original, Optimized, 2-Up, and 4-Up. The Original tab displays the image before optimization. In this case, the sample image is 150K. Click the Optimized tab. In this case the optimized image is only 19.15K — a huge difference. The Optimized tab has a variety of other options that you can explore on your own at another time. The 2-Up and 4-Up tabs display multiple versions of the image to allow easier decision-making. Select the Optimized tab and then click the Save button. Browse to the location where you want to save the optimized file.Save your file on your hard drive or portable storage media (CD-R, USB thumb drive, etc.). Name the file logo.gif. Click Save. Now save a .psd version of your logo banner file. This file can be easily modified. Select File > Save As. Name the file logo.psd. Click Save. Close Photoshop. Select File > Exit.